Hello everyone - thank you for stopping by. Is it getting chilly and feeling like Fall in your neck of the woods? If so, can you send some to Florida? It was 89 degrees again, today. I'm tired of sweating. 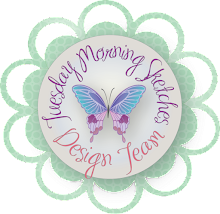 The sketch is up at Tuesday Morning Sketches and it's fun - modern and is perfect for showing off those little stamps and dies that otherwise get lost sometimes on a card. Time to put them in the spotlight. My card features dies from MFT stamps, paper (copper) and stamps from My Hero Arts Sept 2016 kit and an embossing folder by Darice. This is a little more masculine then I wanted but still a nice notecard. I die cut the leaves from the same copper paper that you see in the upper left corner. With this intricate die, it really looks like metal! I love how this turned out. I just got the folder for $2 at JoAnn's and I used it on my pumpkin fairy cottage (found on my FaceBook or Instagram page) and I've really been obessed with it. I used it on last week's card, too. 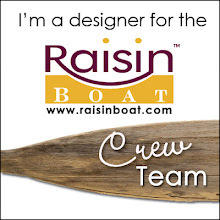 I matted everything with Coffee Bean card stock from Raisin Boat - I can't tell you how thrilled I am that Raisin Boat is afloat again! Be sure to visit the rest of the team - they did an amazing job. No surprise there. I'll see you over at the TMS blog. Have a great week! Hi everyone, thank you for stopping by! The latest sketch for Tuesday Morning Sketches is up and it's a great one. It's whimsical and so super easy. But I just know you're imagination is going to take off in wonderful directions with it. 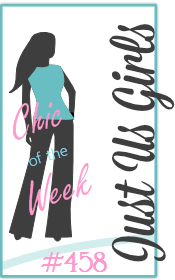 Our sponsor this week is All Dressed Up but with the hurricane last week my card had to be created with manual supplies. We never really lost power completely but with so many tornado warnings it was best to keep everything off and unplugged. 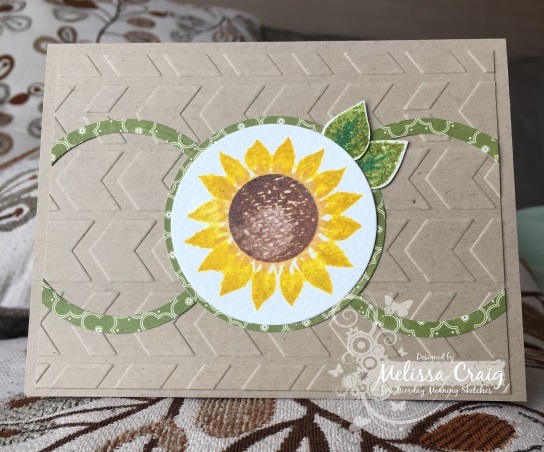 My card features the Harvest Sunflower set by Papertrey Ink. I stamped the images onto watercolor paper using Fossilized Amber and Vintage Photo Distress Oxide inks. I had intended splatters but the water slipped out in one blog so I got a lightened area in the center. I think it looks cool. I stamped the leaves also with Distress Oxide inks - Peeled Paint and Peacock Feathers. 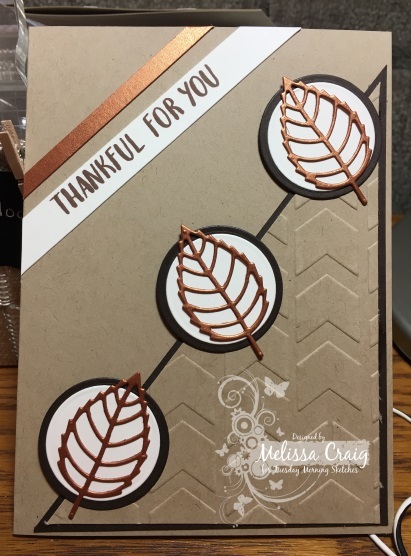 The rest I kept simple, die cutting circles using Stax 1 and 2 dies by MFT and embossing my panel with this neat chevron pattern with a folder by Darice. I didn't realize until I posted this photo that I put my focal image on upside down. The intention was to have the leaves pointing lower left not upper right. We'll just say I rotated the sketch a bit! 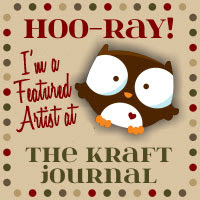 This was a quick card to make and would make a nice note card set. 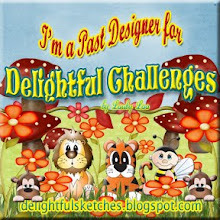 We'll see you over at the TMS blog and don't forget to say hello to the Design Team - they created some great cards! Hello and thank you for stopping by. It's actually Sunday that I am writing this post as I don't expect to have power too much longer. Although Hurricane Irma is not yet here in my area, she's on her way. The sketch is up at Tuesday Morning Sketches and it's a fun one. It's truly an open canvas, great for scenes or to showcase sentiments - let your imagination run wild! Our sponsor is DRS Designs, one of favorite and recurring sponsors. My card features stamps from DRS Designs - Large Filigree Snowflake and Joy of Christmas greeting. I love the color combination of silver (or gray) and red. It's so beautiful! By the time I finished this card, the snowflakes didn't look like snowflakes anymore and now my mind is racing on how else can I use this stamp? I think it would be gorgeous lined up as a continuous pattern. 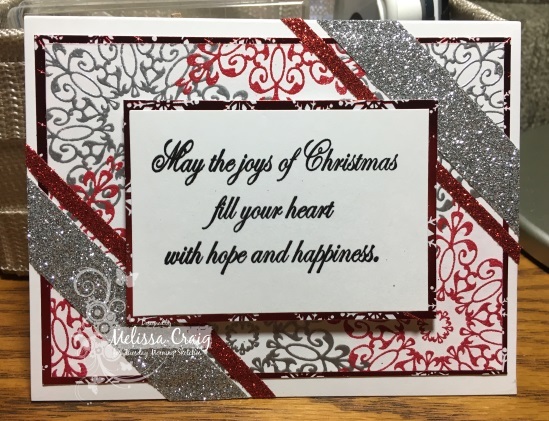 I stamped the snowflakes with VersaMark and used silver and red embossing powders. I've literally had these powders for almost 20 years! Who said they go bad? I wish I hadn't listened to that person because I threw away a lot of powder. Anyway - it turned out beautiful! I then matted the stamped panel and the sentiment panel to some red foil paper from a Christmas paper pack. The sentiment was stamped with VersaFine onyx black and embossed with clear embossing powder. I also added some silver glitter tape and red glitter tape. The red glitter tape, I actually cut a single piece length-wise to make some thinner width tape before adhering to my card. This was actually really quick to put together and would be easily massed produced. If you do the stamping/embossing on an 8 1/2 x 11 sheet of paper and then cut it down - bam! 4 cards ready! Please head on over to the TMS blog and be sure to leave some love for the team. Hi everyone. Thank you for stopping by, I appreciate your visit. The sketch is up at Tuesday Morning Sketches and I love this sketch - it's so cute and such a great jumping off point for any card. I love my card - I wish the photo did this card justice, but it's rainy here. We are in for some serious storms this week. Harvey hurt Texas and I guess Irma is threatening the Bahamas and Florida. Go the other way Irma! 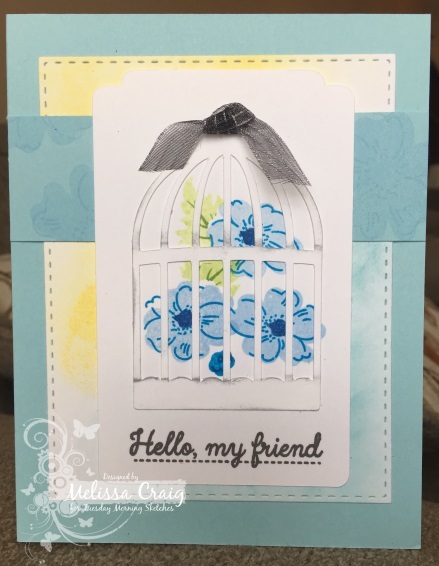 So here's my card - it features stamps from Papertrey Ink, an svg cut birdcage, a die from Papertrey Ink and two Oxide Inks. Again, this picture does not do this card justice. It's actually quite lovely and ink does match the cardstock better than it looks here. Please head on over to the TMS blog and see what the design team created to share with you and inspire! It surely will! !